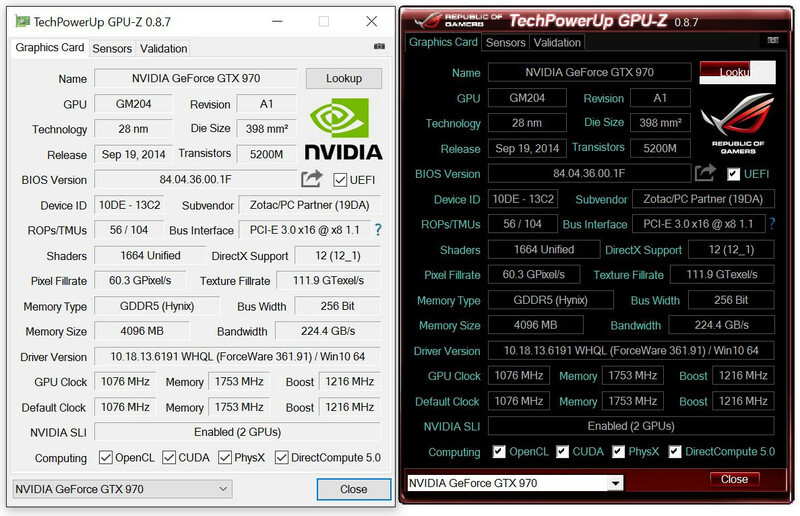 TechPowerUp released the latest version of GPU-Z, the popular graphics subsystem information, monitoring, and diagnostic utility. Version 0.8.7 adds support for new GPUs, fixes a variety of bugs, and improves the interface. To begin with, support is added for AMD Radeon R9 380X, R7 350, and the “Mullins” APU; NVIDIA GTX 980 8GB (notebooks), GTX 965M, GTX 750 (GM206), GT 710 (GK208), Quadro K1200, M5000, M2000M, M1000M, K2200M, GRID K160Q, and Tesla K80; and Intel “Skylake” Gen9 Graphics 510, P530, 540. Among the bug fixes include improved Radeon Software version number detection, correct DirectX hardware-support readout on Intel “Skylake” IGPs, accurate 1.55V voltage reading for AMD “Fiji” GPUs in ULPS modes, a BSOD on Intel “Cloverview” Atom Z2760, SKU naming for AMD “Beema” chips; improved detection of CUDA devices running on Bus ID greater than 9, and a better explanation for OpenCL detection errors. The Armenian language pack has been improved.